There is a man smoking pot outside my room. A wiry, wild-haired Maldivian, he slumps on a palm log under a Hibiscus tree. With one rangy leg folded against his chest, he tokes deeply on what is left of a smoldering joint, and lays his head against the trunk. He is fixated on the horizon. His glassy eyes gaze across the water. Disenfranchised youth, limited possibilities, and extreme isolation, juxtaposed against a world of stunning natural beauty, obscenely rich tourism, and limitless potential. Fraught as it is to take people for symbols, the man strikes me at this moment as a living analogy of the Maldives, this splayed chain of coral islands in the Indian Ocean. Known the world over for its spectacular diving and super high-end, luxury resorts, the Maldives has been tempting well-heeled tourists with deep pockets for over three decades. First-class fodder for glossy brochures. A far cry from the scene unfolding outside my little window, where the stoned villager thrills to the arrival of a friend. The latter has just produced a brand new joint for the two of them to share. The Maldives is, in the truest sense, a country divided. With 1200 islands stretched over 600 azure miles, this nation is separated by more than just water. 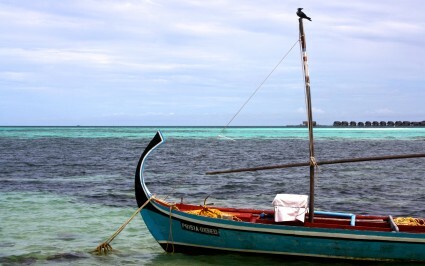 Typically, tourists land at the international airport in Malé, where they are met by a boat. They have booked reservations at a luxurious resort. Sleek watercraft idling at the airport jetty in lines whisks them directly to their hotel. Bypassing the pesky nuisance of having to encounter actual Maldivians, they are delivered directly into the waiting arms of a doting staff. They will spend a week on this private resort island, shelling out an average of $1500 per night. Every activity, every meal, every moment will be orchestrated by the staff, and transpire within the confines of this self contained paradise. At the end of the week, they will generously tip the anonymous laborers, bump over the waves back to the airport, and board their return flight to Boston or Berlin. They will depart with deeply tanned skin, and nothing but words of praise dripping off their tongues for the country they never saw. But this experience is beginning to change. Over the last eight years, the government has begun to loosen its regulations on the presence of foreigners in local village islands. As a result, a number of small guesthouses have sprung up on virtually every inhabited island in the atolls. They offer outsiders the chance to while away countless days on powdery beaches and stroll the sandy lanes of friendly little island villages, all for a fraction of the price of nearby resorts. In the off-season, a clean room at one of these simple guesthouses can go for as little as $30 per night. Suddenly, a destination known for its exclusive clientele has been opened up to an entirely new demographic. But what will they see when they arrive? Unlike the blossom-drenched and teak-floored resorts, which are largely foreign owned and staffed, these local guesthouses sit smack in the middle of Maldivian villages. They are in no way insulated from everyday life, and therein lies the challenge. Maldivian geography cries out to sand- and palm-hungry vacationers, but Maldivian culture does not. The restrictive nature of this conservative Muslim society can come as a shock to the average Western traveler, looking for a budget vacation to Eden. Outside of the private resorts, there is no alcohol, no nightlife, and no bikinis allowed. Furthermore, for the indigenous islanders, the beach has never been a place to lay around and sip colorful drinks. More often, it’s a place where you throw stuff. The beach here on Guraidhoo, where I am currently staying, is often populated with egg shells, broken pots, and the occasional algae covered tire. Not really the traveler’s fantasy. On the surface, such proposals would seem to address a dire need. 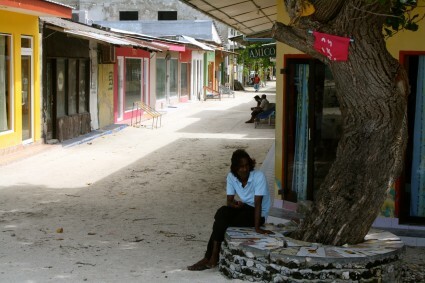 Young Maldivians increasingly find themselves unemployed and bereft of options. They have nothing to do and nowhere to go. Traditional occupations like fishing and boat building are being outsourced to large-scale, professional operations. As a result, the current generation is left to fill much of its time with shiftless and problematic disoccupation. It is estimated that up to 70% of Maldivian youth, like my two young friends who are now fast asleep in the shade, suffer from some type of substance abuse. Still, in the vein of “you get what you pay for,” the local islands are a tremendous bargain. Eighty feet across a channel from Guraidhoo, there is a mid-market resort where lounging Europeans are paying over $800 per night to swim in the exact same water that I paddled around in this morning. They are snorkeling on the same reefs and gazing at the same palms. I’m paying 35 bucks for my room, and Saeed is grilling me up some freshly caught snapper as I write these words. Sure, the beach just in front of the guesthouse might be a little dirty, and populated by Ganja-huffing lay-abouts, but a hundred yards away is a long sandy spur, perfect for swimming or reclining in peace. While the emergence of the budget travel market in the Maldives still has a long way to go, and a great deal to figure out, many people of influence have recognized the imperative need to get there. The future of their society, their economy, and their culture are at stake. There is no shortage of possibilities, but they must now be translated into realities. My two friends on the beach have woken up, bleary-eyed, with foreheads in hand. The sun has moved across the sky, and stolen away their shade. Begrudgingly, they push themselves to their feet and move around to the fat side of a neighboring tree, twenty feet away. They plop heavily down on two net-slung hammock chairs, which will soon inherit the full shadow of the leafy branches above. They are content to sit quietly by, and watch the goings-on at the resort island across the channel. 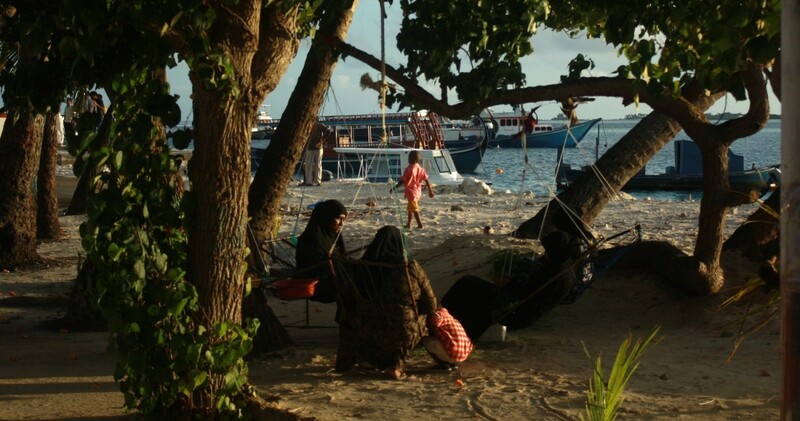 The island of Guraidhoo, and Maldivian society as a whole, cannot afford to do the same. Chris Watts is a regular contributor to EthnoTraveler. He writes extensively about India.